This will list the requirements to get the characters Lv. 11 weapon as well as strategy if one is needed. The characters weapon must be Lv 10. The difficulty must be set to Expert. The stage won't be listed, but it is the characters Legend Mode unless you are going for an Edit Characters weapon. All Lv 11 weapons have Power +60 and will come with 4 items attached to them I will not write the item name, but will write the effect instead so a Peacock Urn Lv 17 will be Life Lv 17. Due note items can combine with your equipped ones, some may hit the cap and some may pass it. Requirement: Find Liu Chan in under 2 minutes, defeat all officers, get 200 KOs and reach the retreat point with Liu Bei within 13 minutes & 30 seconds. Suggested Items: Orb: Ice, Tiger Amulet, Wind Scroll, Tortoise Amulet + your choices. Requirement: Get 200 KOs and defeat Yue Jin, Yu Jin & Li Dian while having the Carriage in danger less than 4 times. If the Carriage driver (not the soldier) calls for help the weapon is lost. Additionally it doesn't matter if you defeat the officers when they first appear or when they are ambush units. It is possible to get the weapon with more KOs and not all officers defeated as I got it with 350 KOs and only 2 of the 3 officers defeated when the Carriage left the castle. Requirement: Defeat Cao Cao with no more than 1 unit clearing Chang Ban Bridge before he appears. To get Cao Cao to appear you need to defeat the playable officers (Xiahou Dun, Xiahou Yuan, Zhang He, Cao Ren, Xu Huang & Xu Zhu). 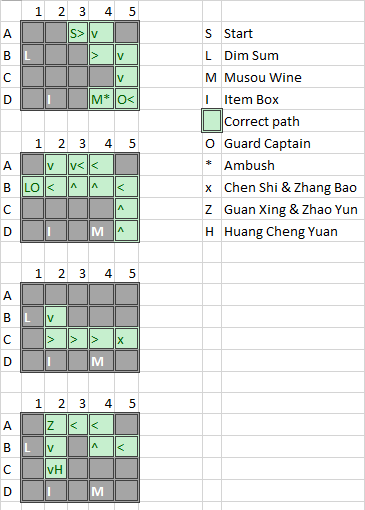 While making this guide I had 1 unit clear the bridge before Cao Cao arrived and 2 after he arrived and got the weapon. Requirement: Defeat Yue Ying 6 times, each time quickly enough to get a "won by a wide margin!" message, also defeat 2 of the other officers. Suggested Items: Orb: Vorpal, Master of Musou, Way of Musou, Tiger Amulet, Wind Scroll, Tortoise Amulet & Elixir. A "won by a wide margin!" message will happen if you take less than 2 minutes to defeat Yue Ying in each appearance. This setup allows for Zhuge Liang's musou to deal Vorpal damage which speeds up the process of defeating Yue Ying, if lucky you can kill her with one musou. Requirement: Within 10 minutes defeat all enemy officers with less than 4 retreat and returns while killing less than 15 peasants. Suggested Items: Orb: Ice, Power Rune, Tiger Amulet, Tortoise Amulet, Peacock Urn & Bodyguard Manual. One of the few stages where bodyguards are useful as KOs they get do not count towards yours. If you get the cutscene with Liu Bei from killing too many peasants you will lose the weapon. If you are in a group with peasants you will want to wait for your bodyguards to defeat them so you don't accidentally do it. Alternatively you can get player 2 to do the requirement as the KOs against peasants only count for Liu Bei. Restrictions: No items & No bodyguards. Requirement: Finish the stage with at least 500 KOs while having double the KOs of the officer in second. This weapon can be pretty fickle to unlock as it is luck based on the other officer KO counts in relation to yours. The best place to get KOs is North of the Gate Captain near Huang Zhong. Shoot Guan Yu off of his horse before he taunts the first time to lower your morale. Defeat all 4 enemy generals except Guan Yu and get 100 KOs. Shooting Guan Yu off of his horse at the start is the real hard part for the weapon since you have soo little time and Guan Yu will tend to move a lot. This can be remedied by keeping track of where he went and going into bow view where he left the screen, when Guan Yu is visible again he will wait for a short while before he starts moving again which gives you the chance to shoot him. Alternatively you can choose to defeat 3 of either Zhou Cang, Guan Ping, Zhang Fei & Zhao Yun while getting 200 KOs. Requirement: Defeat Xu Zhu, Xu Huang, Cao Ren & Zhang He, also defeat either Zhong Hui or Deng Ai while keeping Liu Chan's HP above half. Method 1: Defeat the 3 Xiahous before Zhuge Liang orders to attack Wei Yan (2 minutes & 30 seconds). Method 2: After failing Method 1 defeat all Shu officers and sub-officers, encounter Zhuge Liang and get 200 KOs. Suggested Items: (Method 1) Orb: Vorpal, Power Rune, Tiger Amulet, Wind Scroll & Herbal Remedy. (Method 2) Orb: Vorpal, Tiger Amulet, Wind Scroll, Tortoise Amulet & Peacock Urn. For Method 2 if you didn't defeat Wang Ping increase the KO count to 300. Defeat the Gate Captains at the Northwest & Southwest on the outside. Head into the Western weapon depot and defeat the Gate Captain then defeat Yue Ying. Defeat the North and South Gate Captains while also defeating the Guard Captains to take control of the Arbalest while not killing the Bombadier. Defeat the Guard Captain in the Eastern weapon depot without defeating the Bombadier to take the Seige Ramps. Defend the Seige Ramps until they have setup and meet with Zhuge Liang then get 450 KOs. If you did everything correctly the troops who attack the Siege Ramps should defect to your side and you should get the weapon message at 450 KOs, if you didn't then go for 550. If your favor goes down at all you will lose the weapon. This setup allows for Pang Tong's musou to deal Vorpal damage which makes getting troop KOs easier. Requirement: Defeat all officers with less than 2 Juggernauts destroyed. Do not go too far ahead or an enemy task force will spawn, this can be really bad if you happen to be locked away from the Juggernauts. If you have trouble keeping count you start with 3 Juggernauts and gain 1 for every officer defeated, also it is okay if a Juggernaut happens to steal your kill on an officer. Restrictions: No items & No bodyguards. Start with 1/3 Life. Defeat Cao Xing before he retreats. Make your way to the top right through the river. Meet with Cao Xing before Yuan Shu arrives and get 100 KOs. You do not need to defeat Cao Xing the second time to get the weapon though you are welcome to defeat him again if you can. If you ever go to the top left before the weapon message you will not get the weapon. Requirement: Defeat Hu Che Er & Jia Xu and get 200 KOs. It doesn't matter how many pursuit units stall Cao Cao as long as you meet the requirement. Defeat Yu Jin then his Supply Captain. Defeat Dian Wei's 3 Supply Captains then him. Defeat Li Dian then his Supply Captain. Defeat Dian Wei's 3 Supply Captains then him again. Defeat Yue Jin and his Supply Captain. Encounter Dian Wei for the 3rd time. You will want to use the easing the AI trick for this unless you are really good with Xu Zhu and follow the requirements in order. You must make sure that no Supply Captain makes their delivery, though the 3 that come with Dian Wei's 3rd appearance are okay to let go, but no more than these 3. Restrictions: No bodyguards. Start with 1/3 Life. Requirement: Within 10 minutes defeat all Shu officers and get 200 KOs before ally reinforcements appear. Suggested Items: Orb: Vorpal, Tiger Amulet, Wind Scroll, Tortoise Amulet, Peacock Urn & Charge Bracer. Ride up to the left enemy Gate Captain defeat it so you have less troops to worry about. Afterward make you way to Guan Ping and defeat him hopefully before Zhao Yun follows you to help, then defeat Zhang Fei & Zhou Cang to have Guan Yu letting Cao Cao go event happen. Then take you time getting 200 KOs from remaining soldiers. Cao Ren will appear as reinforcements if you take too long to defeat Zhang Fei to secure the first Escape Point when you make your way North. Requirement: Do not get the "The main camp defense force is dwindling in numbers!" message before Xiahou Dun arrives. Suggested Items: Saddle: Elephant, Orb: Lightning, Power Rune, Tiger Amulet, Wind Scroll & Art of War. It is okay to left a few enemy teams pass by, but if too many go through Zhang He will comment about his formation losing the weapon, it is best to aim for non Private type troops as teams that passed can come back up to fight. Requirement: Keep all Guard Captains alive until Zhou Tai appears and get 300 KOs. Suggested Items: Orb: Vorpal, Tiger Amulet, Wind Scroll, Tortoise Amulet, Elixir & War Drum. May need to get KOs more if Li Dian dies which he tends to never do for me. Requirement: Trigger the rain manually and defeat 9 of the 10 officers. I don't mention a KO count which would be 26 due to the fact that if you use your musou there is the chance that some enemies will get knocked into each other which will result in a kill that isn't added to your counter, rain will automatically happen if 5 minutes pass. This setup allows for Sima Yi's musou to deal Vorpal damage which speeds up the process of officer killing. At most only 3 officers will be on the map at once. Destroy all seige weapon in under 2 minutes. Defeat all officers except Guan Yu and get 200 KOs within 10 minutes. Vorpal Orb is good as it can potentially one shot siege weapons. Method 1: Before Wei Yan stops retreating defeat him. Method 2: After Wei Yan stops retreating defeat Guan Xing and Zhang Bao then get 100 KOs afterward. Method 1 is very hard to do given you have no items, if he reaches the gate that closes before you can defeat him you won't get the weapon from this method. For Method 2 you need to get the KOs after defeating Guan Xing & Zhang Bao, getting it before them will not give you the weapon. Requirement: Choose your side, defeat all officers and sub-officers & get 150 KOs. Suggested Items: Orb: Vorpal, Master of Musou, Way of Musou, Tiger Amulet, Wind Scroll & Tortoise Amulet. Yuan Xi's side is harder due to him charging in recklessly whereas Cao Pi's side will mostly be you by yourself unless another officer (usually Man Chong) is in with you. If you defeat an officer without defeating the sub-officer(s) add 50 KOs to your total per sub-officer missed. This setup allows for Zhen Ji's musou to deal Vorpal damage which speeds up the process of officer killing and getting troop KOs quicker. Get Niu Jin's morale to 8 stars & defeat the 2 Gate Captains. Niu Jin's morale goes up for every 15 KOs you get, it also goes up when you defeat a Gate Captain. Requirement: Defeat all officers except Zhuge Liang and get 50 KOs. Zhang Fei, Guan Yu & Zhao Yun can challenge you to a duel, but only two of the three will do it. Requirement: Defeat Guan Xing & Zhao Yun in under 11 minutes without getting lost in the maze. Encounter Hua Xin with 9 or more units and save him. Gather 12 units and get 450 KOs. There are 15 total units you can obtain, if you lose more than 4 you will not get the weapon. Unite with the 4 women soldiers within 3 minutes of their discovery and have 200 KOs before defeating Xu Sheng & Ding Feng. Do not let Zhou Tai seal the retreat point and cross the bridge with Liu Bei. Despite what sounds like a time limit you can take as long as you want. The women soldiers spotted message only pops up if you are within a range of them and the first one always joins as the stage starts. If you have less than 200 KOs after defeating Xu Sheng & Ding Feng the weapon is lost if Zhao Yun appears as reinforcements which happens if you have less than 200. Zhou Tai will retreat to the the South after having half his health depleted or Jiang Qin is defeated before him. If doing this in 2 Player both players have to get 200 KOs for Zhao Yun to not appear as reinforcements. Requirement: Defeat Hua Xiong, Hu Zhen & Lu Bu as well as defeat all Gate Captains and encounter Dong Zhuo in under 6 minutes. Suggested Items: Power Rune, Tiger Amulet, Wind Scroll + your choices. Requirement: Defeat Zhang Liao 3 times and get 500 KOs with no ally defeated. It is best to force Zhang Liao out early and get your KOs before you defeat him the first time to help your allies survive longer since his morale will always go back up to 7 when he returns. Also you need to finish the stage by stealing a horse which Zhang Liao conveniently always comes with to get the weapon. Defeat Zhou Cang then Liao Hua quickly after. Defeat the middle Gate Captain, then defeat Guan Ping. Guan Yu enraged, no ally officer defeated and get 50 KOs. Suggested Items: Orb: Ice, Tiger Amulet, Wind Scroll, Tortoise Amulet, Elixir + your choice. You have to get 50 KO after defeating Guan Ping. Also if allies defeat Zhou Cang or Liao Hua you will still get the weapon. Defeat Yue Jin & Li Dian before they quell the confusion. Defeat Cao Xiu or Zhang Liao. "Damage to the Wei Army is spreading!" message happens three times. The confusion gets quelled at around 8:10 left in the stage. The amount of troops to defeat to spread damage isn't consistent due to variance so you need to see the message 3 times. Requirement: Reach the Wei Ship without being discovered in under 3 minutes & 30 seconds. Make your way to the center of the map while hugging the upper wall and approach the center gate from the South, when the defense force gets alerted drop a bomb and run to the right side wall while keeping them out of your sight. If you can make it past the gate before Ling Tong starts going South you can go to the Gate Captain that he started by and should move to the top left of the area and hide for a bit. Ling Tong & Lu Meng will eventually meetup and you will want to wait for Lu Meng to head back near the top right Gate Captain. When Lu Meng patrols again make a beeline for the Wei Ship after he has moved back down hopefully getting there before Gan Ning notices you and finishes his dialogue. You will want to stay near Lu Meng in bow view to keep him moving, but not too close that he comes after you. Requirement: After defeating Yu Ji's real body complete the stage within 1 minute and 50 seconds, also this must be done in under 5 minutes. Suggested Items: Power Rune, Tiger Amulet, Wind Scroll & Art of War. It doesn't matter how many times illusions appear. Defeat the 3 Loyalists' prior to the rockslide trap in under 1 minute of their appearance, this must be done in under 6 minutes. Get 300 KOs in under 15 minutes. If Sun Ce kills a Loyalists it will not count. It is recommended to save after each Loyalists incase you don't kill the next one fast enough or Sun Ce takes your kill. On the last 2 Loyalists don't take the Speed Boots in the box on the right ridge of the rockslide trap as you will need it to run to the Loyalists that is further away from you. Get Xiahou Yuan to appear with more than 15 minutes left and meet up with Da Qiao. Defeat Xiahou Yuan & get 100 KOs. Xiahou Dun, Xu Zhu, Dian Wei & Cao Ren will re-appear if you defeat them before Cao Cao's 4th appearance which eats up time, so damage them enough so you can kill them at the end. Xiahou Yuan appears after all other officers have been defeated after Cao Cao's 4th withdrawal. Defeat Taishi Ci & Liu Yong and get 500 KOs. Suggested Items: Orb: Lightning, Tiger Amulet, Wind Scroll, Tortoise Amulet & Elixir. Lightning Orb is mainly to deal with massive crowds to save the sub-officers without knocking enemies into them with the C4. If you don't get the message at 500 KOs you likely already got if you didn't notice it earlier. Requirement: Defeat Hua Xiong in under 10 minutes. It doesn't matter if you get detected, it just makes it harder as you have to face Lu Bu. Make sure to wait for the message as you can leave before it pops up meaning you have to do the stage again. Suggested Items: Orb: Vorpal, Master of Musou, Way of Musou, Tortoise Amulet & Peacock Amulet. The suggested items may seem weird to have a defensive build rather than an offensive one, this is due to the last hit of the True Musou having elemental properties of the Orb you have equipped. This is also so that you can kill troops away from officers so that you don't kill them by accident. If you feel safe being in Red health you can switch Way of Musou for Elixir. Also apparently you need 800 KOs before Liu Bei, Guan Yu & Zhang Fei show up, though that should be no problem to do if you keep away from killing officers to raise your KO count as Sun Jian & Cao Cao will retreat after enough troops have been defeated with them around. Requirement: Defeat all of the Eunuchs and get 100 KOs. Suggested Items: Orb: Vorpal, Master of Musou, Way of Musou, Elixir, Tortoise Amulet & Peacock Amulet. The suggested items may seem weird to have a defensive build rather than an offensive one, this is due to the last hit of the True Musou having elemental properties of the Orb you have equipped. This is also so that you can kill troops faster and drain a set amount of health from Yuan Shao if you happen to land the last hit of the True Musou on him. If you feel safe being in Red health you can switch Way of Musou for Tiger Amulet. Yuan Shao being alive doesn't matter for the weapon, Wen Chou and Yan Liang don't need to be defeated. Requirement: Defeat all enemy generals except Gongsun Zan and get 100 KOs without prestige diminishing or dissatisfaction from Zhang He or Tian Feng. If prestige diminishes once KO count becomes 200, if it diminishes a second time the weapon is lost. If Zhang He or Tian Feng are dissatisfied the weapon is lost. With Bai Ma Calvary you simply need to knock them off of their horses to prevent their provoke to lower prestige. Requirement: By 8 minutes into the stage only 1 enemy Gate Captain left while having over 100 KOs. If you finish the stage in under 8 minutes while having over 100 KOs you will still get the weapon. This setup allows for Zhang Jiao's musou to deal Vorpal damage which speeds up the process of officer killing and getting troop KOs quicker, C4 is good for troop KOs while anyone hit by the musou will basically be dead if you aim slightly to the left of them from your view. Requirement: Defeat all enemy officers (except Sima Zhao) while saving all allies (except Zhu Rong). Suggested Items: Orb: Vorpal, Master of Musou, Way of Musou, Elixir & Wind Scroll. You can get an early start on Xiahou He before Yang Feng shows up, if you defeat Xiahou He before he arrives it will count as saving him. Deng Ai & Zhong Hui should not be approached until the Xiahous have been dealt with. You don't have to keep your allies alive after saving them. This setup allows for Meng Huo's musou to deal Vorpal damage which speeds up the process of officer killing. Requirement: Encounter Zhuge Liang in under 4 minutes without being discovered. The first messenger by Wang Ping is unavoidable so defeat him and his messenger. You can practice the level to get a feel for the layout of the Guard Troops to not be spotted by them. Defeat Taishi Ci & Liu Yong and get 500 KOs while defeating all Gate Captains. Suggested Items: Orb: Lightning, Tiger Amulet, Wind Scroll, Tortoise Amulet & Master of Musou. This is the same as Zhou Tai except you have to defeat all Gate Captains, you have to get the KOs before defeating all of the Gate Captains or you won't get the message. Lightning Orb is mainly to deal with massive crowds to save the sub-officers without knocking enemies into them with the C4. Requirement: Choose your side, defeat all officers and sub-officers get 150 KOs and defeat all Gate Captains. Suggested Items: Orb: Vorpal, Tiger Amulet, Wind Scroll, Tortoise Amulet, Art of War + your choices. This is the same as Zhen Ji except you have to defeat all Gate Captains, you have to get the KOs before defeating all of the Gate Captains or you won't get the message. If you defeat an officer without defeating the sub-officer(s) add 50 KOs to your total per sub-officer missed. Suggested Items: Power Rune, Tiger Amulet, Wind Scroll + your choices. Secret of Orbs if using Vorpal Orb. This is exactly the same as Sun Jian's weapon. Requirement: Find Liu Chan in under 2 minutes, defeat all officers, get 200 KOs and reach the retreat point with Liu Bei within 14 minutes & 30 seconds. Suggested Items: (Spear 1 & 3) Orb: Ice, Tiger Amulet, Wind Scroll, Tortoise Amulet + your choices. (Spear 2) Power Rune, Horned Helm, Tiger Amulet, Cavalry Armor & Elixir. This is exactly the same as Zhao Yun's weapon with an extra minute added. Sub-officers not required for this weapon. Guan Yu enraged, no ally officer defeated, get 50 KOs and defeat the other Gate Captain. Suggested Items: Orb: Ice, Tiger Amulet, Wind Scroll, Tortoise Amulet & Elixir. This is exactly the same as Lu Meng except you have to get the KOs before defeating the second Gate Captain. Finding weapon hard to get due to the AI being too aggressive? Here's a way to make them less aggressive making these be easier. Start the stage on Expert and make a save immediately, go to the options and change the difficulty to Beginner and start a different stage with any character. After the stage has loaded in battle soft reset (Start+Select) and go back and continue to your original save, enemies will now be more passive.